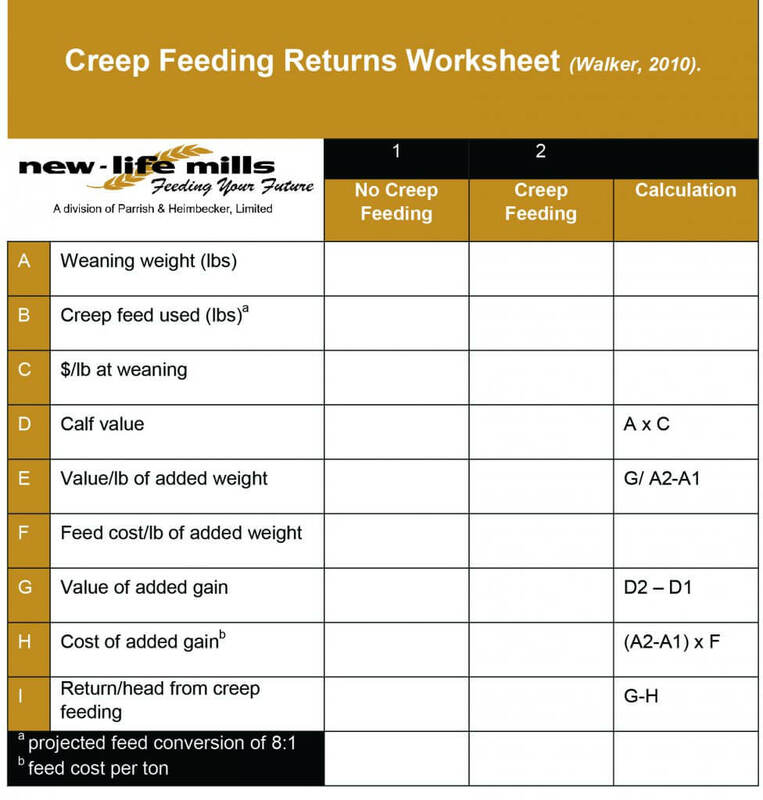 Creep feed is commonly used to increase the growth rate of nursing calves. This is done by restricting a feeding area to provide nursing calves with access to additional nutrition, thus supporting their early growth including increased average daily gain. Other benefits include more uniform calves, reduced weaning stress, and supports post nursing health of the cow. During the first 90 days of lactation, most calves receive sufficient nutrition from the cow. After this time, calves will consume an increasing amount of forage, typically high-quality pasture, which is an economical way for calves to grow. If rapid growth is the goal the calf must consume highly nutritious, well-balanced feed. To support early health and rumen development a calf’s diet can be supplemented with a high quality, highly digestible creep feed. Grains within the creep feed will help build the rumen by encouraging a strong rumen microbial population. As the microbial population is initiated volatile fatty acids are produced enabling better digestion of forages. Creep feed is always important early in life but especially important if forage quality is reduced e.g. during the winter or periods of drought. The economic advantage of feeding a creep feed is fully realized when it is designed to meet what is missing from the available pasture. Jensen et al, 1999 showed an increase in gain of 7.8 kg when comparing pasture fed only to pasture fed + creep fed (ad libitum). Placement of the creep feeder will affect the success of the program as well. They should be placed in an area where the cows will visit frequently (calves will follow the herd); examples would be where there is access to water, salt or mineral. The area should be large enough for the whole herd to gather. It may be necessary to place more than one creep feeder, depending on the number of calves and size of the pasture or area. When starting calves on a creep ration keep feed fresh feed to appetite and clean up any leftover feed each day. Molasses and/or bran mixed with feed encourage consumption. Roll or coarsely grind grain to prevent fines and dust. Allow 10–12 cm of bunk space per calf in creep feeder when self-feeding; 20–30 cm of bunk space when hand feeding. The decision to creep feed will depend on the profitability of the program. Homegrown creep feed may seem less expensive than commercial creep feed, however, purchased commercial feeds will be formulated for optimal animal performance and usually results in a less digestive upset thus better intake of nutrition and calories. So, when considering your goals and options you need to take into consideration more than just available on farm forages vs the cost of commercially made creep feed. To determine the economic advantage of feeding creep feed per additional pound of weight, multiply the cost of feed per pound by the projected conversion rate; i.e. pounds of feed consumed per pound of added weight gain (Dhuyvetter, 2007). Table 1, indicates a worksheet producers can use in order to determine the profitability of their feeding program. Creep feed has a good role to play in a well-balanced beef program by starting nursing calves off right. Creep feeding will be more effective when the calves’ supply of other feeds (milk, pasture, cow ration) is limited in quantity and/or quality. The profitability of creep feeding is dependent on the cost of the creep ration, the price received for calves and the conversion of creep to daily gain.